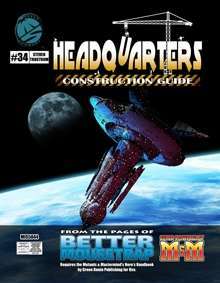 The Headquarters Construction Guide excerpts the new headquarters content from Better Mousetrap 3e and presents it as a stand-alone product. This means that if you plan on buying the latter, you do not require this product on its own. Within the Headquarters Construction Guide you will find a new, more detailed system for creating headquarters that accounts for available space and how much a feature requires. This allows for greater control over what your headquarters can become, and helps you better visualize its layout while also accommodating new features that take this system into account. Within this product you will find this new headquarters construction system, over 50 HQ features, both new and redesigned to work with this system, over 20 HQ power effect extras for tailoring powers purchased as features for use in your headquarters, the idea of headquarters complications with examples, and sample headquarters revised to work with this new system. For those of you who prefer the previous, simplified headquarters construction system included in the core rules, the new headquarters features have also been provided in a format compatible with the original HQ design system.